I’m in a garden in Japan and newness rustles every leaf, bends every slant of light. In my dream, I’m set down amidst the yellow glow of foliage, branches arching overhead, a wind chime tings with gentle breaths of fall. Back among the heavenly bamboo, leaf tips blush cerise from creeping cold, a gray stone tachi-gata lantern marks the passing time. Light and dark, summer and fall. It’s steps that mark the journey, all that really matters. Around the corner, along the path, a moon bridge arches over, red and welcoming. Wooden steps, up and over, soft indents worn from the scuff of many feet. And mine, they fit the groove of those who’ve gone before. Beneath, water spaffles into the catch pond, laughs over the rocks, gurgles into crevices, settles to reflect the bridge. 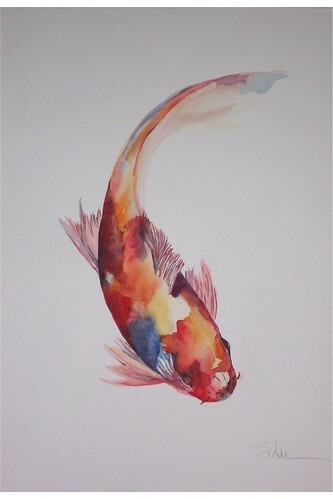 Fat orange and black koi fin through the riffles making music, singing to the leaves dappling their pond. They say the tea master Sen-no-Rikyu built a garden enclosed by a tall hedge. It blocked the view of the sea. The man who wanted the garden built was not happy—until he knelt to wash his hands in the basin beside the pond. He spied the sea on bended knees between a gap in the bamboo. He smiled and saw the water in his basin echoed the sea and the ocean sloshed in a great hand bowl, the universe captured within the foliage of his garden. I know this garden, it is mine and it is not Japan. I sit inside an exotic refraction of my ordinary yard. And yet, the air is foreign on my skin, odd in my respiration. It has blown across the sea and I swim in a world of golden light, making bread crumbs — as if I too had koi.